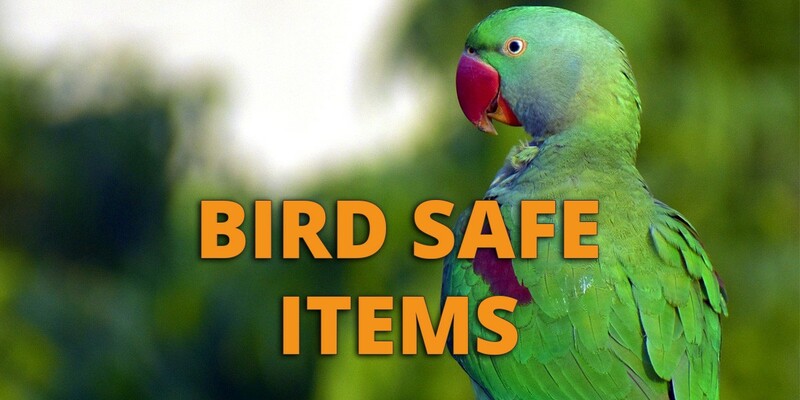 One aspect of pet bird ownership that is sometimes overlooked is the need to carefully choose bird safe items for your home. Many products that we wouldn’t think twice about using can have very detrimental effects on our birds. If you are in the habit of allowing your bird to roam around your house a bit, you need to ensure that they do not have access to materials that can be harmful. We also need to be careful about what kinds of toys and other items we use in their cages. The choice of the wrong type of toys or perches can lead to tragic consequences. Here’s an overview of some products that are safe for birds. We will also see some that should either not be used, or used very carefully, in your home if you have a pet bird. Non-stick cookware, such as Teflon, emits gasses when heated that are poisonous to your pet bird. Improper use of this type of cookware has been responsible for the demise of many pet birds. Additionally, if you cook for your pet with this cookware, the coating can chip and introduce toxins into your bird’s food. This type of cookware needs to be used very carefully with ventilation keeping all the noxious fumes away from your bird. A better option for bird owners is to use cookware that does not pose this problem. It is well worth the replacement costs of your kitchenware to make absolutely sure that your bird stays safe. 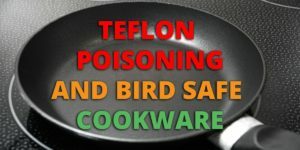 You can read more about teflon poisoning and bird safe cookware here, along with lists of cast iron, ceramic, and stainless-steel cookware that are safe for use around your birds. Paint can come in contact with your bird through a number of different avenues. Bird cages and toys are one potential source of exposure. If your bird has access to painted walls or furniture then they can be in contact with potentially harmful substances. 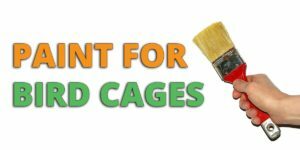 Good cage manufacturer’s know to remove lead and other toxins from most cage paints and therefore have alleviated the problem of your bird ingesting poisons. But you should take extra care with commercial grade paints as they may be subject to less stringent safety controls. You want to use a paint with zero volatile organic compounds (VOC). These are compounds that leach into the air as the paint dries. Though some paints have low-levels, it is best to be VOC free in the paint you choose as the compounds will affect both you and your pet birds. A situation many pet bird owners face is the prospect of repainting a birdcage. With proper preparation and paint choice, this can be a great way of extending the life of your bird’s living quarters. For more information on bird cage paint, check out our detailed guide here. Birds in the wild instinctively know which plants may be dangerous. Your pet bird may not have these facilities and it is your responsibility to restrict your choice of houseplants to those that are safe for your pets. Some plants are extremely toxic to birds and need to be avoided so birds cannot obtain access to them. An extensive list of safe and unsafe plants is available at the eclectusparrotbreenders.com website. 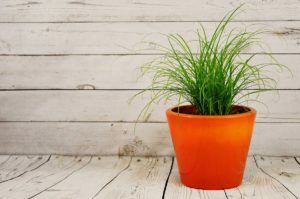 Consult a list like this before purchasing any houseplants. Review what you may already have in your home and take appropriate action for the safety of your bird. Many items that you will use with your birds will be at least partially constructed from wood. You may be inclined to build a bird tree out of branches or to make your own perches. As with houseplants, you need to take care that the wood you use is non-toxic to your pet. When making toys or perches, you need to consider the hardness of the wood, and the type of bird you have. 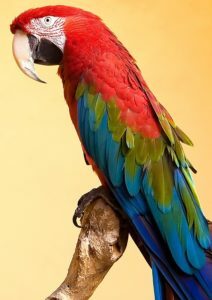 Your parrot may destroy softer woods very quickly and be totally uninterested with a very hard wood that they cannot chew. Also be very careful to buy woods that haven’t been treated with toxic chemical such as pesticides or herbicides. More details on using bird safe wood during aviary construction can be found here. Wood toys for your pet bird should be made of bird-safe woods as described above. Toys made of cardboard and heavy paper can be a good option if you want your bird to have something they can shred. Other toys, such as those made out of rope and plastic can pose problems. Rope toys can fray and your bird can get its claws and feet tangled in it, causing stress or injury. Plastic toys present a number of potential issues. Regarding the safety of your bird, you need to ensure that the bird cannot crack the toy and be exposed to sharp edges and slivers of plastic. Another factor to consider is the everlasting properties of plastic, so when the toy is discarded it will live in a landfill forever. Biodegradable toys make a better choice for your pet and the planet. To see how to make your own bird toys check out our entire article on it here. Zinc and lead are two of the most problematic metals for your pet birds. They are extremely toxic and should be totally avoided in constructing your pet’s environment. As a general rule, metals that are galvanized AFTER welding are safe whereas galvanized BEFORE welding is not safe. Stainless steel is perhaps the best metal to use with birds but also the most expensive. To see more details on using bird safe metals in aviary construction, see our guide here. Birds have extremely sensitive respiratory systems that are easily impacted by airborne chemicals. Take care when cleaning your bird’s cage, perches, and any area in close proximity to your avian housemate. Safe, homemade disinfectants to use are mild dishwashing detergent, white distilled vinegar and water, steam, grapefruit-seed extract, and baking soda. 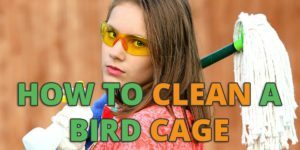 You can see a detailed article on how to clean your bird cage safely in the following article available here. The same concerns over disinfectants carry over to the use of aromatic air-freshers, candles or incense in your home. Aerosol sprays should be avoided even when used a substantial distance away from your bird, as the toxins in the products linger in the air and can travel throughout the house. Carper fresheners can also be toxic and should not be used. 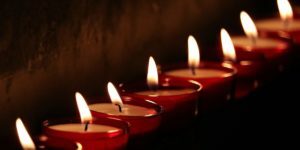 Candles made of 100% beeswax with no additives are safe for use in your home. Incense can impact the bird’s nervous system as well as its respiration and should be avoided. With proper supervision, glass should not be a major problem for your pet bird. Don’t expose them to uncovered windows or mirrors and you should be fine. Pet bird owners, in all likelihood, also care about the wild avian populations outside their homes. 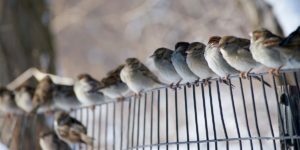 To protect against birds crashing into your windows, you can use tempera paint or decals so the birds recognize that there is a barrier to be avoided. 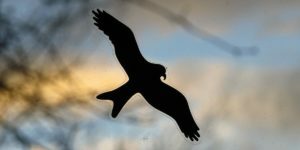 New types of bird-safe glass are available for construction which have an ultraviolet reflective coating visible to the birds, or have silk-screened designs that alert the bird that this is not an open area safe for flight.